$5040 AUD per person twin share; $650 single supplement. See our full detail of 2017 Tour Inclusions. We meet in Nice on Sunday 9 July. Nice is easily accessible with direct flights from Australia. Hotel check-in is usually from 2pm onwards. We have pre-dinner welcome drinks in the evening at a bar near our hotel. 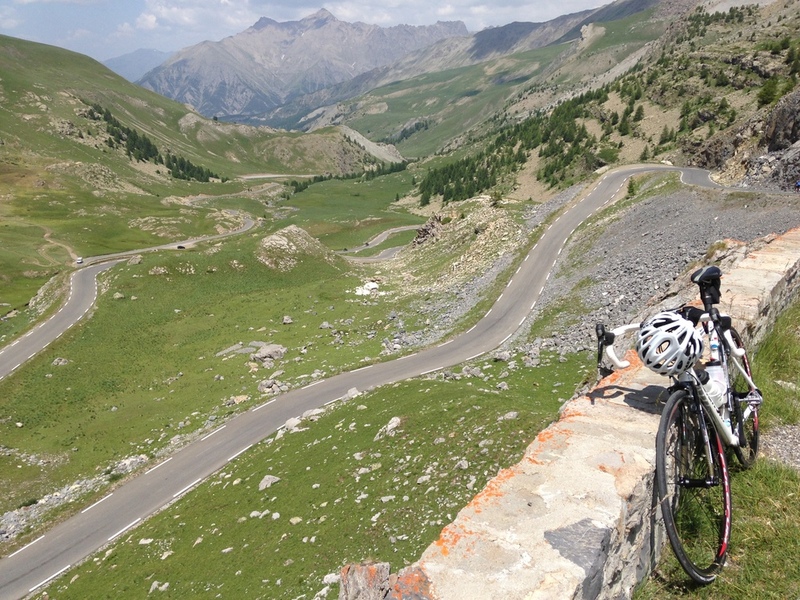 Check out more photos from our previous Nice to Alpe d’Huez Cycling Tours on our Flickr Gallery. Today is a mountain climbers dream and one of the most challenging days of the trip! We cycle the two climbs of Stage 17 of the 2017 Tour de France that also feature as the 2017 Etape du Tour - the beautiful Col du Vars (2180m) followed by the epic Hors Categorie climb, the Col d’Izoard (2361m). The Col d'Izoard is famous for its forbidding and barren scree slopes and jutting rock pinnacles, known as the Casse Deserte, that has formed a dramatic backdrop for key moments in the Tour de France and will host the final mountain climb of the 2017 Tour 2 days later! The descent is spectacular, sweeping and fast, to arrive at the town of Briancon, a UNESCO World Heritage site, where we stay in a private chalet for 3 nights. Our chalet has a spa and sauna, comfortable living areas and a sun-deck with sweeping views of the Alps! For 3 nights we stay in the French Alps in a prime position private chalet to watch the Tour de France and do loop rides each day! The final mountain stages of the Tour are always a highlight and often where the Tour is won or lost. WE WILL SEE STAGE 17 & 18, GET UP CLOSE TO THE RIDERS, THEIR TEAM CARS AND SUPPORT VEHICLES AND STAY AMONGST THE ACTION! Today is another highlight day of spectacular mountain scenery and climbing. We depart Briancon to ride to the Col du Lauteret, a gradual 28km climb. We continue over the 8.5km winding road to the Col du Galibier (2642m), one of the most dramatic high alpine passes in the Alps. We descend to Valloire and it's a last up and over the Col du Telegraph to our overnight stop in the Maurienne valley. THE FINAL MOUNTAIN STAGE OF THE 2017 TOUR DE FRANCE WILL BE 178KM OF PURE DRAMA. We cheer the riders from the best position on the COL D'IZAORD - THE FINAL MOUNTAIN CLIMB & enjoy the atmosphere & action of the Tour – it’s an unforgettable experience! Tour de France Stage 18, 2017 - with the finish on the Col d'Izoard! Stage 18 of the 2017 Tour de France promo video - the route in 3D! Our last day on the move is an epic ride, climbing over 3000m in altitude. In the morning we ride the famous Col de la Croix de Fer, descending to the cyclists mecca of Bourg d'Oisans. We then set off to conquer the 21 hairpin bends of Alpe d'Huez for a celebratory group meal at our hotel! Day 14 is an optional loop ride - a spectacular day riding some lesser known, but no less spectacular climbs, along corniche roads over looking the Oisans valley. We'll take you to our favourite mountain restaurants with panoramic views of the Alps. Our final night is Sunday 23rd July and on Monday 24 July, you need to organise your own onward travel arrangements from Alpe d'Huez. Our finish location is Alpe d'Huez but we will assist with transport to Grenoble (via a fantastic Alpine bus service that carries bicycles). Grenoble has a train station with rail links to Lyon or Paris for TGV (very fast train) and international airports with flights to Australia. Each day we get to watch a mountain stage of the Tour de France, we provide you with various options for viewing the Tour including loop rides and additional climbs located in and around Briancon. When we are in Alpe d'Huez - your crew will take you on a spectacular loop ride with a memorable lunch stop with views over the Alps! Loop Rides are optional - you can relax around our chalet, visit the nearby towns and villages or those with weary legs can have a day to relax - after all, it is a holiday!